HISTORY: Handbook of Texas Online: "Welfare is believed to have been established in 1866, although exact documentation is not available. The town started to flourish when the San Antonio and Aransas Pass Railroad operated freight and passenger service from San Antonio with connections to Fredericksburg and Kerrville. Mail service by stagecoach was operated as early as 1847. The walls of the Stagecoach Stop and its smokehouse are still standing with gun turrets for fighting robbers and Indians, intact. The town of Welfare also had a gristmill, cotton gin, and several homes, a saloon, hotel, general store, post office and schoolhouse. The original store and post office, a two-story structure, burned down in 1916 and was rebuilt that same year. From 1921 to 1978, Perry J. Laas and wife Alma operated the store and post office. In 1978 the store closed and had remained so until November of 1998, twenty years later, when Gabriele Meissner McCormick and David Lawhorn reopened the doors." Old-timers in the Welfare community are not sure how their post office got its name. The Settlement was first known as Bon Ton, but that was changed when it was learned that another post office had the same name. More history is displayed on the Welfare Cafe's web site with pictures of old newspaper articles. Addresses below for these businesses show Boerne, which is their mailing address, but they are located in Welfare (no Welfare post office). DON STRANGE RANCH: 830-537-3156; 103 Waring Welfare Rd, Welfare, TX 78006. www.donstrangeranch.com. Catering, event venue, entertainment, adventure course. DON STRANGE RANCH ADVENTURE CHALLENGE COURSE: see above. www.waringgeneralstore.com. Adventure facility on the Don Strange Ranch features kayaking, climbing and zip line tours, disc golf. Has 4 zip lines (high and low) on Zinc Hill. Custom designed programs to fit the need of the client regardless of size. Each program lead by staff who help people step out of their personal comfort zone and into a learning zone. Open by reservations only. NELSON CITY DANCE HALL (& PO-PO's FAMILY RESTAURANT, see below): 830-537-3835; 825 FM-289, Boerne/Welfare (Kendall County), TX 78006. 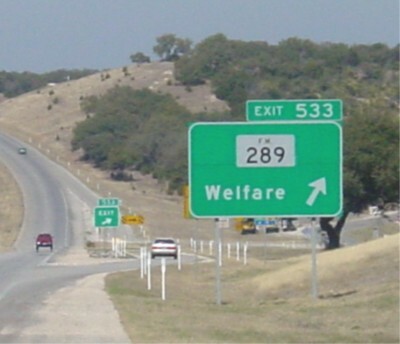 Just S of Welfare; 1/2 mile off IH 10 Exit #533 (Welfare Rd. Exit), NW of San Antonio By Boerne. Currently is a dance hall and restaurant (Old San Francisco Dance Hall & Saloon). Circa 1929. Open: Wed-Thur 5p-11p, Fri-Sat 4p-2a, Sun 2p-10p. "From the comforting sounds of violins and guitars to the flushing faces of happy two-steppers and waltzers. If you haven't experienced a Texas honky-tonk, then you haven't experienced Teaxs! For a true Texas encounter you really need to leave the city, because it's in the country where dance halls begin. They have served as the small town's courting stage, musician and singer's sounding stage and the dance lover's dream. Well, Nelson City Dancehall serves up all of these and more. Located next to an old 1929 dancehall in Nelson City, Texas, this family owned treasure is the genuine article. Promoting Texas music including Tejano, Country, Zydico, Rock'N'Roll, Blues, and Bluegrass, Nelson City Dancehall provides live music every Friday, Saturday and Sunday. Musicians enjoy playing here because of the family atmosphere and the acoustics, and as one put it, "It's the most beautiful dancehall in this part of Texas." Friday night is steak night! Dine, dance and have an excellent steak." WELFARE CAFE: 830-537-3700; 223 Waring-Welfare Rd, Boerne, TX 78006. www.welfarecafe.com. Downtown Welfare (Welfare Exit off I-10). Fine dining, German & international cuisine. Indoor or patio dining. Reservations required. Live Music Thur & Sun. Large party barn with built-in stage, dance floor, huge limestone fireplace, loft and kitchen for your next special occasion. Must be seen to be believed.